Formatting your computer and installing a fresh operating system is a must have skill for the 21st century. Backup your files and write down the software you will want to re-install. Restore your files and programs. Windows installation disk available at most retail outlets like Best Buy or Fry's Electronics. Backing up your files is a basic practice that you should already be doing. All of your important documents and pictures should be backed up automatically, it is generally free and the only reason you aren't doing it is because you are lazy. One of the biggest stumbling blocks here is misconception. Many computer semi-literates hold onto the notion that specific types of data must be stored on special media. ie. Music on CD's, video on DVD's, etc. This is not the case! It is all data and can be stored right along side any of your other files, the place you store the data is irrelevant. Secondly, people become fearful that they cannot do this on their own. I have no idea why. If you can pack your physical stuff into boxes to move apartments, then you can pack your digital stuff into digital boxes to move computers. Because this portion of the process is the easiest to be put out by, I am going to ramble a bit. Sorry for that, but I want to try to walk through it as slowly and stress free as possible. I cannot recommend Dropbox highly enough. They will give you 2gb of free storage, and the opportunity to earn lots more for free usually by trying new features, liking on social networks, or inviting your friends. Because Dropbox is so perfect for backing up your files easily, I am going to talk about using it in the backup portion of the process. You could easily migrate your data to a portable HDD or flash drive instead using the same method. Likewise you could burn all your data to cd's or more likely DVD's. If you just don't care about any of your documents then you can skip this step altogether and they will be eradicated from existence. Sign up for an account with them. This will monitor your files for changes and automatically upload new files to the cloud. Rant: Many people cling to the idea that installing things slows down your computer... that's true it does... but for some reason they will install every antivirus program known to man (tremendously stupid) but refuse to install a useful program like dropbox because they think it will bog their system or give the terrorists their credit card. This is akin to filling a VW Beetle with machine guns to protect yourself, while using it to pull a trailer filled with rocks so that you can easily build a fortified wall wherever you stop, and driving up the steepest mountain road in the world. Then refusing to take along a nice picnic basket because you are worried about its weight slowing down your car. Pack all of your digital files into your new digital box! Cut and paste anything that you want to save into your new dropbox folders. Move the documents out of your "~/User/My Documents/" folder into "~User/Dropbox/Documents/"
Do the same for "My Pictures". If you use itunes to download all of your music then you can simply re-download your purchases after wiping your computer. No backup required. If you have some ripped music or illegally downloaded files you will need to save them to an external hard drive or a thumb drive. They are likely too big to fit in a dropbox. Just copy them all to a thumb drive or to a portable hard drive. Alternatively you could sign up for a paid account with dropbox and keep all of your files stored securely with no hassle. Paying for dropbox will allow you access to a theoretically unlimited amount of storage space. LET YOUR DROPBOX SYNC YOUR DATA! Dropbox must upload all of your data to the cloud. That takes lots of time depending on how much space you have used. If you have too much data, you may want to let your computer run overnight. Now that you have let your files sync to Dropbox, and saved any large files to a flash drive, you are safe. You can access all of the files you saved from any computer in the world by securely logging into the Dropbox.com web page. AND, when you we are done re-installing windows all we have to do is install dropbox again on your fresh computer, it will automatically download all of your files for you! Very convenient! Lastly, write down all of the programs that you want to re-install after the format. You will need their installation disks or you will need to download their installers from the web. The most important piece of information to save is the product key for any purchased licenses. Write it all down now! It is easier than trying to find the info after the fact! You probably don't use 90% of the applications on your computer. Just write down the one's you ACTUALLY use! There is no reason to fill your computer with useless junk right? Almost every program you use is probably free. If they are asking you for money, there is probably a free alternative to the program that works even better. Most of the stuff you use can be installed for free by visiting the Webpage. HINT: you DO NOT need to give them your email, and you should ALWAYS be checking what you click. DO NOT let them send you spam and they won't! The formatting of your hard drive and installation of the new OS are the easiest portions of this tutorial. These days the installer for Windows or Linux is completely automated. All you have to do is prepare a suitable boot disk and do what the installer tells you to do! Decide which flavor of linux you are going to use. You can check out this post if you need help. You can follow this guide to installing Ubuntu. FYI Linux mint uses the exact same installer. Ninite for linux to get some apps... though it is recommended to get a hang of linux before installing things willy nilly! Most windows laptops have a recovery partition that allows you to enter recovery mode while your computer is starting up. This will restore your computer to the state it was in when you bought it. This method varies from computer to computer, but the on screen instructions will tell you what to do. 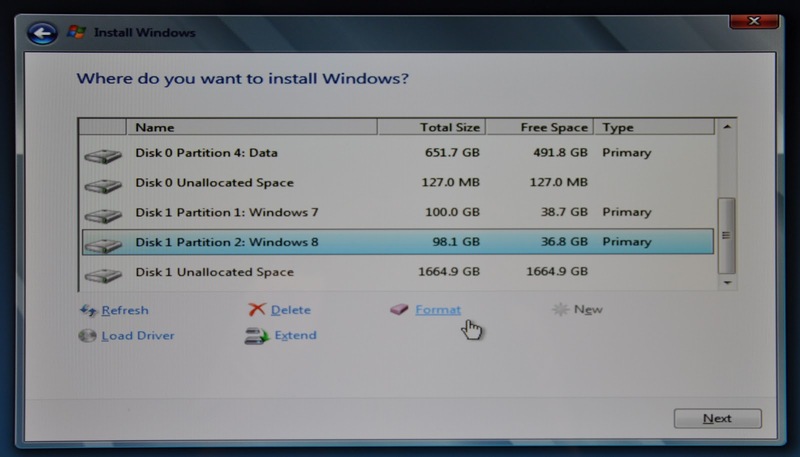 The recovery partition contains a copy of the windows installation files along with anything that the computer hardware manufacturer felt like including OR was paid to include. I prefer to install from a fresh Windows disk (option 2). Buy a fresh copy of Windows. Your computer came with a Windows license code when you bought it, but you probably lost the code it immediately. If you still have the code you can download a free copy of windows from the Microsoft website and burn your own DVD or USB boot disk. Since you almost certainly lost your key, you will be buying a new one from the store. Take solace in the convenience of trading money for less work. If you downloaded a copy of Windows you need to burn it to a DVD (or make a USB boot disk). There are instructions to do this on the Microsoft website. Once you have your Windows installation/boot disk, put it into the cd drive or USB port and reboot your computer. If the computer starts back into windows normally, then you need to change your 'boot' order. Under BOOT settings change the 'dvd-rom' drive or 'USB removable' to a higher position than your 'HDD'. If you have done this correctly then the computer will load the installer from the disk. if windows comes up again, then go back to bios and try again. All BIOS menus are similar but not identical. ie. I can tell you more or less how to buy a snack from a vending machine, but I cannot predict the exact machine you are going to use. I can say insert coins, select snack. I cannot say put in three quarters, a dime, and a nickle, then press the green button followed by E5 and you will get M&M's from every vending machine on Earth. Follow on screen instructions until you are faced with the hard disk partition selection. This is the "formatting part" It is preferable to remove all of the preexisting partitions from the hard drive for various reasons. This will ensure that you have a fresh disk. Delete every single partition by highlighting them and clicking delete. 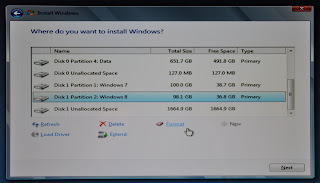 Once you have deleted all of your old partitions install to the free space. If the installer will not let you install, then just create a new partition and use the entire disk. After that you will just continue to do what the installer tells you! Eventually you will boot into windows and you are done! It would be wise to now install all of the available windows updates! Then check out this post The first thing to do after installing Windows! If you installed dropbox using Ninite, just log in and the files will begin downloading automatically. You can copy any large files back to your computer from flash drives or external hard drives. Install any other programs from your list and restore your licences! THAT'S IT!!! YOU ARE DONE! You just formatted a computer and installed a new operating system! Thank you for the support Berta! I think formatting the computer is the best solution to speed it up. It's because the process is direct and on the spot. No need for further troubleshooting just to know why the computer is slowing down. It’s also very effective because, in a sense, it completely resets your system and cleans everything. That means it gets rid of all the viruses an anti-virus program may not be able to detect. For this reason, I bought an external hard drive to back up all the important files in my PC. I’ve also made a habit of burning my files into DVDs in case something happens to my HD. Today we have many options of hardware, operational systems and software, general prices had gone down, and some cell phones are Hardwareexpensive than a computer. And what about quality? Well, seem that the border is not so clear, and there are some pretty expensive machines out there, that don't last as long as we expect.